When is an American, Hollywood-esq movie not actually an American, Hollywood-esq movie? Well, it transpires that Steel Country is exactly that scenario. On first watch, Steel Country has all the hallmarks of being an American production; it was filmed in Georgia, USA, all the characters speak with American accents (whether the are or not), and it’s a familiar feel to it. However, Steel Country is anything but. 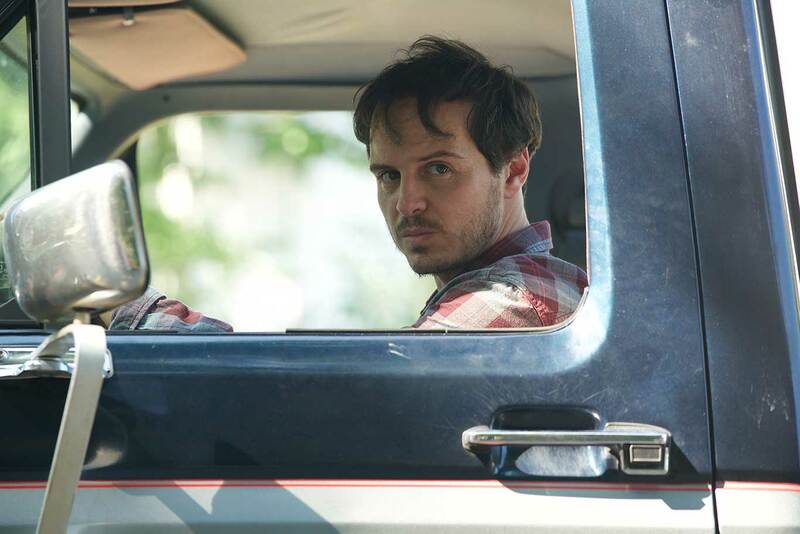 It’s actually a British made movie, made by Bedlam Productions in London, with a lead actor in Andrew Scott (“Spectre“, “Denial“) who is from Dublin and a supporting actor in Denise Gough (“Colette“, “Guerilla (TV)”) who is from County Clare in Ireland. Not that you’d know it from the accents they maintain throughout. Scott is Donald Devlin, a bin-man, and appears to be on the autistic spectrum, and Gough his assistant, along their regular route Scott sometimes see a young boy in the window who waves to him. When that young boy goes missing, and is subsequently found drowned in a local river, Scott isn’t convinced by the explanation given by the police. Scott goes about attempting to piece together what has actually happened to the young boy, much to the chagrin of many in the town, particularly the local sheriff, Michael Rose (“Pitch Perfect 3”, “Hangman“), who wants to keep whatever is going on, quiet. The film is written by first-time writer Brendan Higgins and directed by Simon Fellows (“Until Death”, “Blessed”). It runs at just an hour and 25 minutes but unfortunately it feels a hell of a lot longer. This is one of the slowest films I’ve seen in a while. It painfully drags itself through the mud of the story and the ending, when you are expecting the usual mad-half-hour, just fizzles out. Quietly. The performances are good, Scott in particular is excellent, though Gough is good as well, but there was never any doubt that the man could act but, somehow, he seems out of place in Steel Country. It’s almost as if his performance is to good for the film. Weird. Fellows does well behind the camera, it looks good and he doesn’t go down the route of filming trees blowing in the wind or anything like that. Though that’s definitely a good thing given how slow the film is without that. The film feels very familiar, we’ve seen these sorts of films time and time again, amateur sleuth investigating a crime and unfortunately Steel Country doesn’t manage to do anything different with it. Even Devlin’s apparent autism doesn’t really come to the fore and help in anyway, or hinder that much. It’s a shame that Steel Country doesn’t ever manage to get out of first gear, a performance this good from Scott deserves to be in a much better film. Watch it for the performance, or hope that Scott can be in something that doesn’t make you want to switch off.